Many children learn to subtract by counting the items in one groups of objects, and then counting down the items in another group of objects. 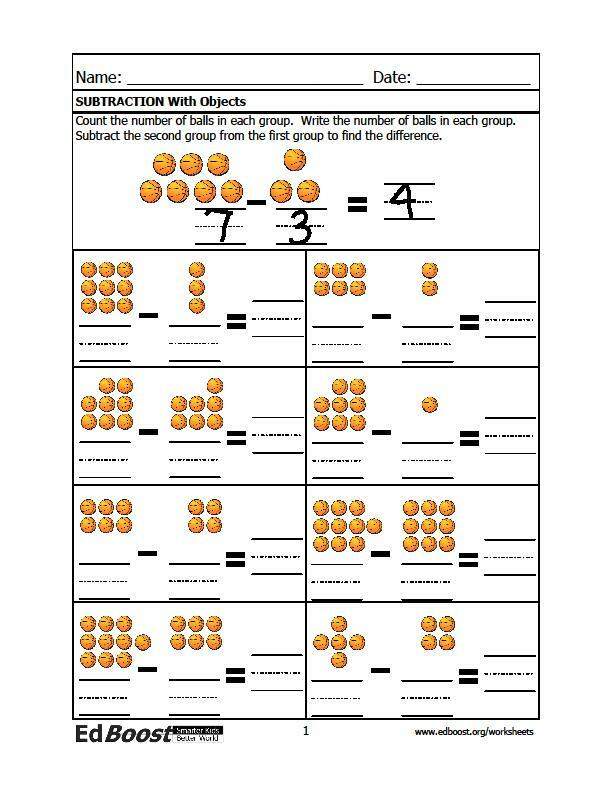 This packet helps children learn subtraction through counting. Each problem presents two sets of objects written like a subtraction problem. Students are asked to count the number of objects in the first group, write the number of objects below, and then count the number of objects in the second group and write the number of objects below. Students are then asked to find the difference (and can use the objects to count down). This introduction to subtraction also gives students practice counting and writing numbers. The first three pages in this packet focus on subtraction facts up to 20 (with a focus on subtraction facts up to 10). The last three pages include larger numbers and include subtraction problems with numbers as high as 30.